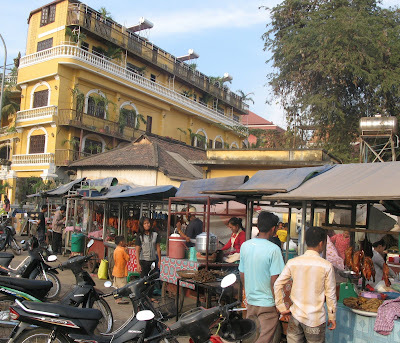 Strewn along both banks of the Siem Reap River, the provincial capital of Siem Reap town serves as a gateway to the ruins of the Angkorian-era Khmer Empire. Before a few dozen years ago, the town was little more than a cluster of old villages built around individual pagodas, and was later combined with a French colonial-era center. This “French Quarter”, when combined with the Chinese style architecture of the old market area, offers a five square block area with an amazing variety of restaurants, tourist shops and a vibrant night-life. In fact, the main street through the French Quarter is called Pub Street, and pretty much every night the drinking starts in the late afternoon and continues into the wee hours. Surrounding the town center is a rather typical Southeast Asian town that offers scores of mid-range priced hotels as well as a number of inexpensive guest houses. Our guest house, called Eight Rooms, was nothing fancy, but it was clean, quiet, had internet wi-fi, located only two blocks from Pub Street, and was priced at $18.00 per night. That’s hard to beat anywhere in Asia. If you’re the type of traveler who likes to pamper yourself, crowding both sides of the 6 km road that connects the airport to the center of town are dozens of stock five-star hotels. There is however a great five-star experience in the heart of town tucked in Pub Street alley called Hotel BE Angkor and the posh The One Hotel, a single spacious and luxuriously appointed room for the discerning traveler. Brainchild of a charming American, and owner of the chic Linga Bar across the alley, their guests are spoiled during their stay in Siem Reap. 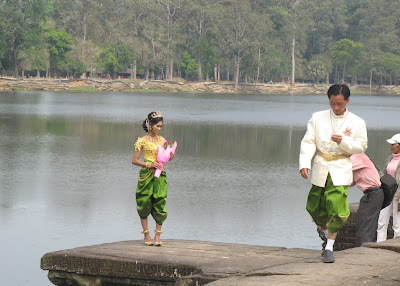 Rates are in the $250 USD range but they offer so much more than staying at any one of the non-descript five-star fortresses along Airport Road or the main road leading to Angkor Wat. 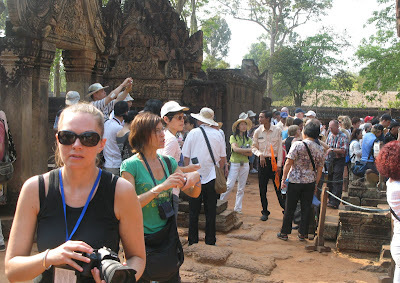 Siem Reap is easily managed even for novice travelers. The de-facto currency is US Dollars and there are no transactions done with coins so if you pay with dollars, small change will be given in local currency (riel). Everyone speaks English and most of the signs and restaurant menus are printed in English. It is a town devoted to tourism. 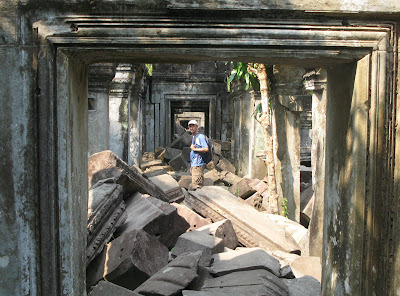 I could see only two drawbacks to the town: some parts of town are a bit dirty with trash strewn everywhere, and it’s hard to take ten steps in any direction without being accosted by a tuk-tuk driver wanting to take you to the ruins or anywhere else you want to go. 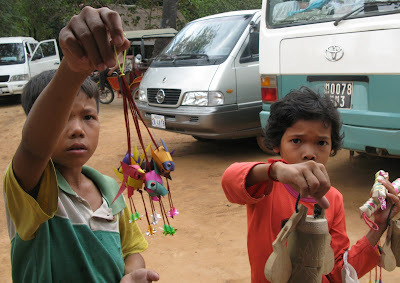 The trash is easily ignored and the simple shake of the head tells the tuk-tuk drive not to bother you further. 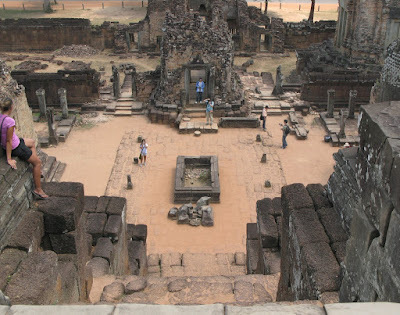 The main attraction to the area is not the town, of course, but the hoards of millemnium-old temples in the Angkor Archaeological Park that UNESCO has designated a World Heritage Site. 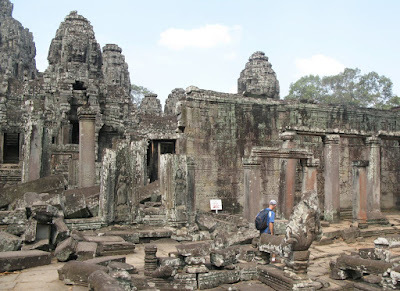 These temples include Bayon, Banteay Srey, a host of other temples and monuments, and the legendary Angkor Wat, each of whose artistic and archaeological significance places them in a class with the Pyramids of Giza, Machu Pichu and the Taj Mahal. 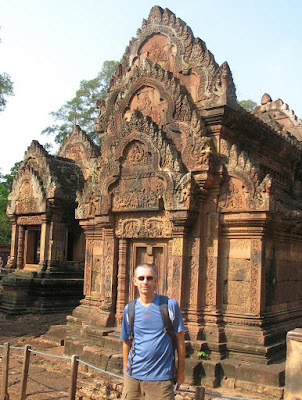 Although we stayed in Siem Reap for two weeks, mainly because it’s an interesting and inexpensive place to hang out, an aggressive traveler can see all the noteworthy temples in about three days. In fact the tour books break it out into three, one-day tours: The Outlying Tour circuit, best done by car because of the vast distances between temple sites; The Grand Tour circuit which takes in most of the lesser significant temples in the main UNESCO park, and can be easily be seen by tuk-tuk or bicycle; and The Small Tour circuit which takes in only the three most significant sites of Angkor Wat, Bayon, and the Angkor Thom complex, and again, can be seen by tuk-tuk or bicycle. Some visitors only spend one day ($20 for a one day pass) exploring the must-see temples and take the Small Tour circuit, while others buy a seven-day pass ($60) and crawl through each temple at a glacial pace. We recommend the three day pass ($40) and suggest you save the Small Tour circuit for the last day, because if you start with the Small Tour and explore the most significant sites first, all the other sites may seem a bit disappointing. 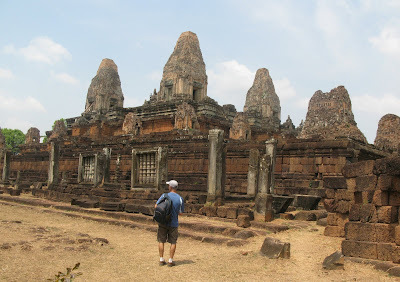 Better to start with the outlying temples and finish with Bayon and Angkor Wat, saving the best for last like a scrumptious dessert after a satisfying meal. And due to lighting conditions, Angkor Wat is best seen in the late afternoon, or early morning. 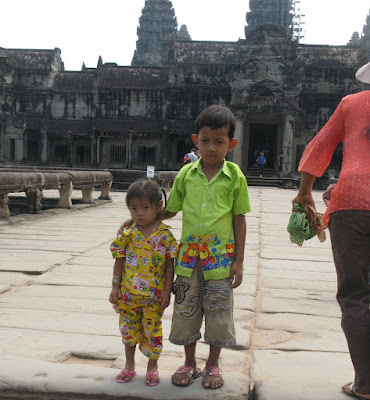 Angkor literally means ‘Capital City’ or ‘Holy City’. 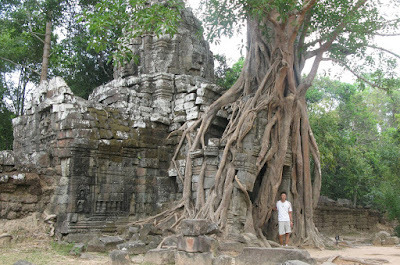 Thus, the temple ruins in the Siem Reap area are the remnants of the Angkorian capitals, and represent the pinnacle of the ancient Khmer architecture, art and civilization that flourished in this area between the 9th and 12th centuries. 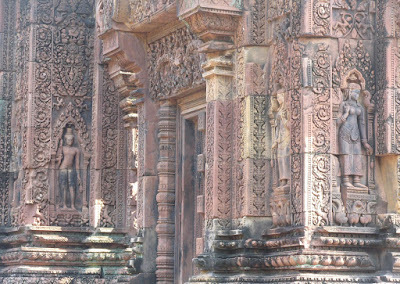 The stone carvings of two religious groups can be seen in these temple walls – Hinduism and also Mahayana Buddhism. 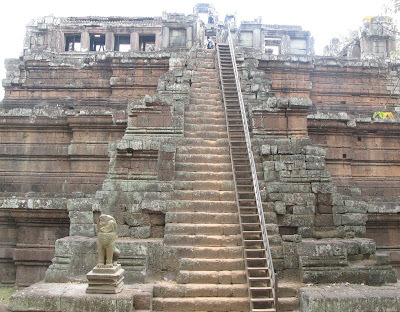 Most of the best known structures were built by the legendary Khmer King Jayavaman VII, who drove the Cham people out of Cambodia and broke with 400 years of Hindu tradition and made Mahayana Buddhism the state religion. 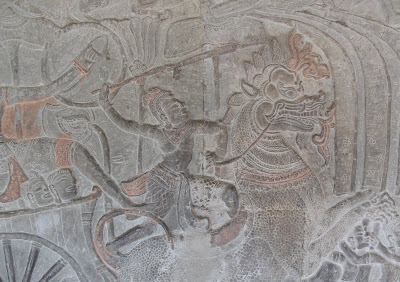 But Hinduism made a comeback in the 13th century under Jayavarman VIII and many of the images of the Buddha on the temple walls were either scratched out completely or crudely altered into Shaivite lingas and Bodhisattvas. 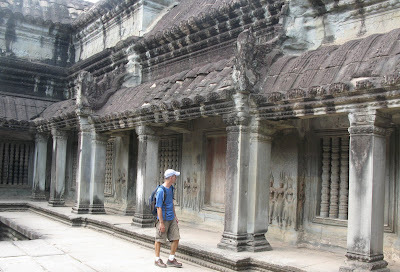 Of course Angkor Wat is visually, architecturally and artistically the most breathtaking of all the temples. It is a massive three tiered pyramid crowned with five lotus-like towers to form a temple-mountain dedicated to the Hindu god, Vishnu. 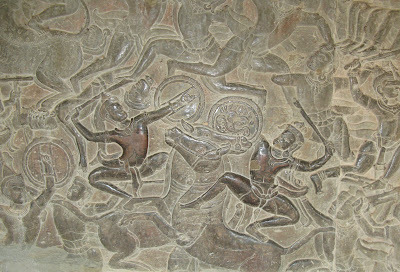 The walls of the temple are covered inside and out with magnificent bas-reliefs and carvings. The whole complex is surrounded by a massive moat, and the outer walls measure 1300 meters x 1500 meters. 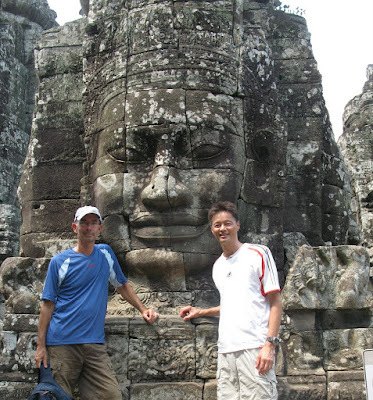 But equally impressive are the giant stone faces of Bayon. There are 37 standing towers at the temple, and all but a few sport four carved faces oriented towards the cardinal points. 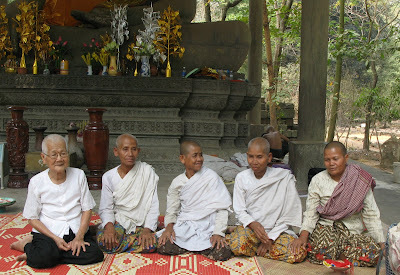 They are all the same face, and most experts seem to think it’s the face of Jayavarman VII. The temple, although impressive, seems to be an architectural muddle, in part because it was constructed in a piecemeal fashion for over a century. 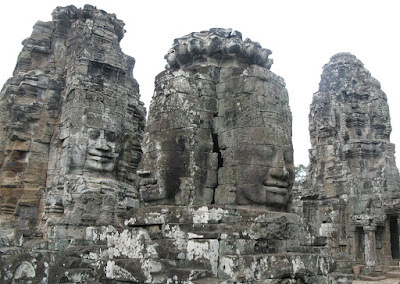 Angkor Wat and Bayon are indeed impressive sights but a visit to Siem Reap, should include time for some of the less visited temples and monuments. 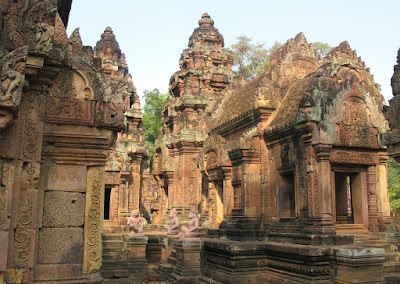 Some of our favorites are Beng Melea with a similar layout as Angkor only less reconstructed and a must for temple crawlers looking for that “lost temple” feel, and Banteay Srei (although quite visited) with it’s exquisite pink sandstone carvings in an isolated, semi-wooded setting. 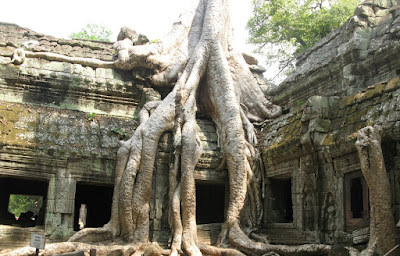 Ta Prohm is a temple complex where giant trees grow right out of the temple walls, their bare roots snake along the stone ramparts and are slowly turning the temples to rubble. 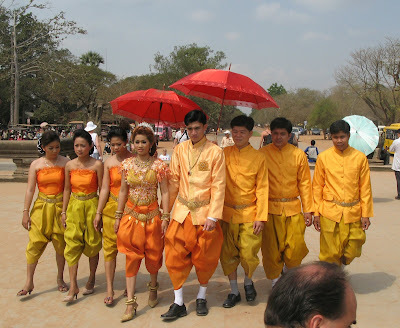 Wedding Day at Angkor Wat. It’s easy to get “temple overload” as there simply is a great deal to see. Guidebook touts are at the entrances to practically every temple in the Siem Reap area selling $20 to $30 guidebooks for a mere five dollars. 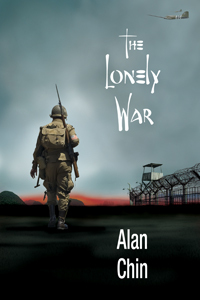 A personal guide can be hired for around $25 a day. Tuk-tuks for the day run from $10 - $15. 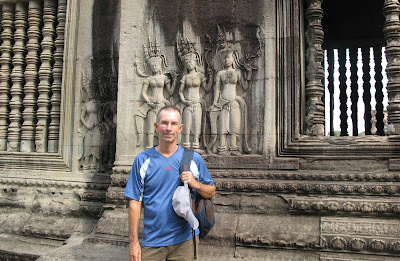 Cars are $20 - $25 per day for temples in the main temple complexes including Angkor Wat and Angkor Thom. Trips to the outer temples add to the tab. 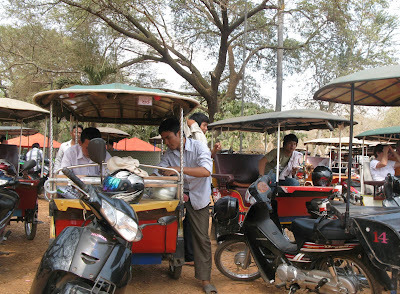 There are also motorbike taxis and bicycles for rent for the truly adventurous. 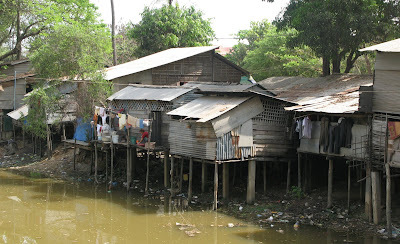 Siem Reap is a city built for tourists in all price brackets. 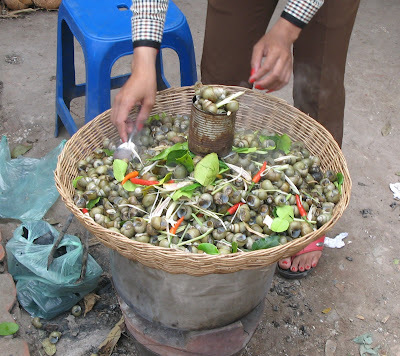 The Khmer food is exceptional and utilizes a lot of healthy ingredients. 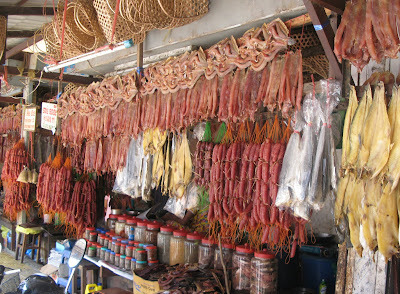 Our favorite is the quintessential Khmer dish, Fish Amok. 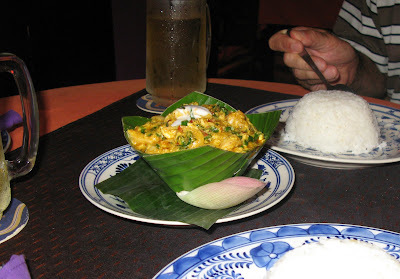 Fish steamed in coconut to a mousse-like texture with a wonderful array of herbs and spices including turmeric, galangal, lemongrass, krachai, slok gno leaf and palm sugar, all beautifully served on banana leaf parcels. Thankfully there were no western fast food restaurants in town yet, although KFC will be opening adjacent to the new museum, but there is no shortage international cuisine in Siem Reap; everything from pizza and burgers, to Indian and French. Climbing is involved when visiting some of the temples. 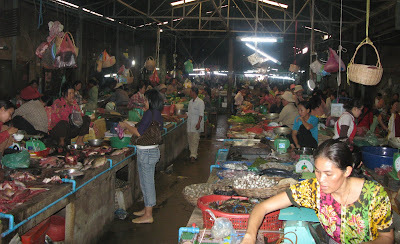 In the night market, we saw something that we had never seen before or even heard of. 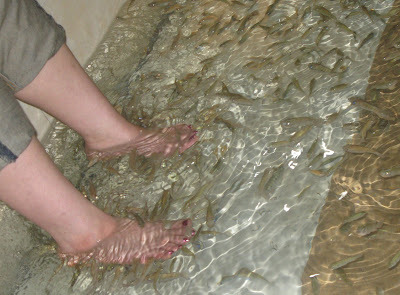 They call it ‘fish massage’ and it consists of a large tank of water holding hundreds of ravenous small fish. You place bare feet in the water and fish swarm to your feet and eat the dead skin from your toes and soles. We didn’t take advantage of this, but we watched several people who did, and there seemed no end to the laughter, theirs or the spectators. We couldn’t tell if the fish were tickling their toes or that it was just so joyful to be doing something so utterly unique, but everyone laughed like clowns. The Night Market, the adjoining Crocodile Night Market and Noon Night Market all have a spattering of the usual souvenirs but the best place we found to shop is the Old Market near the French Quarter. It’s a mixture of souvenir shops and stalls catering to the locals with vendors selling fruits, vegetables, meats, clothes, and small appliances. Gone are the days of deserted temples. 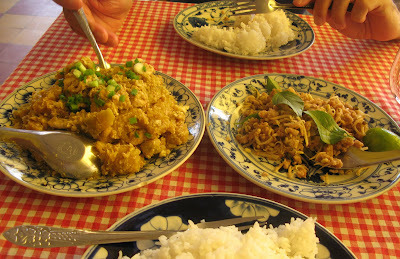 Pumpkin curry and Lok Lak. * If you arranged for your hotel to pick you up at the airport, look for a sign with your name on it. There is also a curb-side limousine desk where you can hire a car to take you to your hotel for $5 USD. 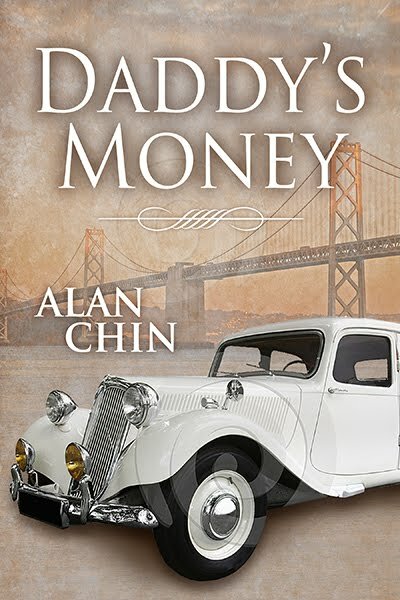 Airport taxi drivers will often offer you their services for around $25 a day. 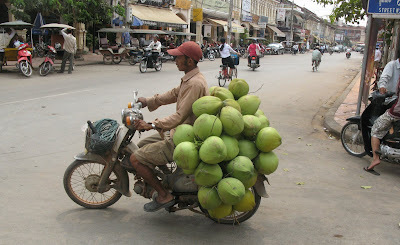 A "moto" or motorcycle taxi is a cheap option into town for a buck or two. * After dark, head into town around Pub Street for a meal. Try one of the many Khmer family run restaurants dishing up local dishes like Fish Amok, Luk Lak, and Banana Flower and Mango Salads. Best place for a drink in Siem Reap - The Linga Bar. * Stay at least 3 days. Passes to the ruins are sold for the day ($20), three day ($40), and one week ($60) per person. * Try taking a moto at least one day to the temples. 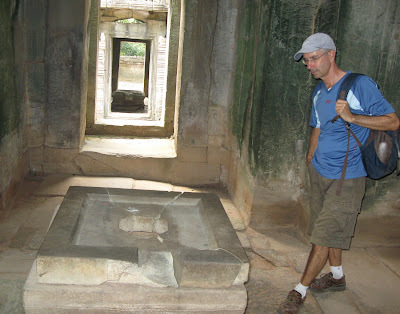 Angkor Wat, Angkor Thom, and many other temples are within easy reach by moto from town. I would reccomend a car for the outer temples since the distances are greater and the roads can be dusty. Pick up a handy Canby Guide at restaurants, guesthouses, hotels, and bars around town.